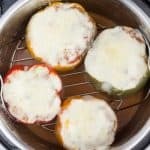 Fully flavored stuffed peppers with melty cheese. Using sauté setting – Add ground beef, onions, salt, pepper, and garlic powder. Cook until beef is fully browned and onions have softened. Drain off excess fat and return beef to cooker. Add tomatoes, rice, Worcestershire, and sugar and mix well until fully combined. Then add 1/4 cup of parmesan and 1/4 cup fontina. Mix well then pour meat sauce into a bowl. Cut off tops of 4 bell peppers, then remove seeds and ribs from peppers. Ladle beef/tomato mixture into peppers. Add 1 1/2 cups water to pressure cooker and add trivet. Do not rinse out pressure cooker prior to adding water. (see note) Place filled peppers on top of trivet. Cook for 4 minutes at high pressure. Once cook time is complete, allow pressure release naturally (about 6 minutes). Top cooked peppers with 1/4 cup parmesan and 1/2 cup fontina (not pictured). Place lid back on top of pressure cooker and leave for a few minutes to allow cheese to melt. You do not need to rinse out the pressure cooker before adding the water. The remaining residue from the meat and sauce mixture will add additional flavor to the peppers. Also, this filling is very saucy. We like that! But if you prefer, you can reduce the amount of crushed tomatoes to fit your liking.